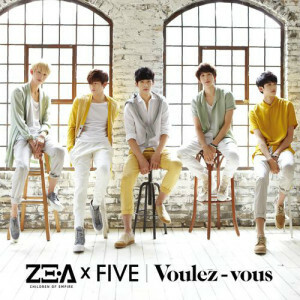 Despite being originally molded as a group for the J-pop market, ZE:A5 has expanded into K-pop, releasing this week its first single and MV for “The Day We Broke Up.” For people who don’t follow ZE:A5, the group is a subunit of ZE:A, the nine-member boy group that debuted under Star Empire Entertainment in 2010. ZE:A5 is being marketed as a vocal group focused on ballads and love songs, as opposed to the dance tracks and upbeat pop from their root group. It’s been a while since ZE:A has appeared on the scene as a full team, and there are mixed feelings among fans toward this subunit venture. There’s no doubt that subgroups create divisions in perceived popularity amongst members of larger groups, and this seems to be a primary concern among fans of ZE:A. To make a proper case of it, this writer has found it hard to ignore the disparity in allotted screen time within ZE:A5 itself. With focus given to three out of the five members — namely Dong-jun, Min-woo and Siwan — this subunit appears to be more ZE:A3 then ZE:A5; remaining members Hyun-sik and Kevin get half as much screen time. All points considered, it could very well have been the bad (hair) days that Hyun-sik and Kevin were having that put their scenes on the chopping board, but neglect to include them in the vocal side of things makes it apparent that it could simply have been a company decision. Based on the workings of the melodies in “The Day We Broke Up”, Dong-jun — a fine young man with a nice nasally timbre — seemed a far less competent choice in comparison to both Kevin and Hyun-sik, who possess higher vocal ranges. At the get-go, these disconnects seem quite unsettling, but let’s move on to the music video. The MV is a refreshing break from the angst-filled, watch-me-cry, I-only-wear-black, breakup MVs we see from most boy groups. As established by the boys running in a forest and camping in the midst of bright colors, coupled with giant mushrooms and a ton of adventure props, this production has evidently been given a Peter Pan fantasy twist. To nitpick at the sequences, the scene in which Dong-jun is reading a treasure seems slightly misplaced, as the guys don’t actually go on a search for anything. Criticism aside, there isn’t a solid storyline to pick on; the guys are simply having fun in a camp setting, which thankfully, they’re able to pull off. The MV has the usual compilation of solo shots, dance scenes, and group moments. For once, though, the scenes make sense with the flow of the lyrics. Their separate solo shots in the beginning look melancholic and lonely, which fit with the sadness of the ‘breakup’. However, as the song progresses the lyrics talk about moving on and learning to enjoy the moment, which we see as all the members ease up and hang out together. It’s the reality of this behavior — to go on a camping trip with friends to get your (or our) minds of something — that draws the viewer in. A subliminal message, by way of a lit-up “present” sign, denotes the meaning behind the song’s lyrics — to live in the moment. In terms of sets and choreography, the fantasy interpretation of camping in this video has given the producers at Star Empire room to free their idols from their dancing containers. Commendably, they even allow ZE:A5 to roam in the wilderness. Aside from their unorthodox truck-bed activities (a la the drive across the highway), the landscape transitions are fairly eye-catching, and the warm tint to the video shines through. A key section of the video is the movement of scenery into the magically set up camp site. Eye candy at its finest, the various hues and the sun’s rays among the tress meld together to give the MV a soft, pleasant tone. The colorful tents were also especially striking; the color variation added dimension to a background that would’ve otherwise looked stale. With the added observation of peculiar (and/or unique) prop placements — a comfy chair and piles of books in the middle of a field; roasting marshmallows and sipping ice-blue drinks under the riveting light of the campire — it’s clear that escaping mundanity is a running theme. Simply, the aesthetics of this clip should not be overlooked. The outfits fit seamlessly into the MV; none of them were over-the-top and no obscene amounts of accessories were hanging off ZE:A5’s members. The slight exceptions to this were Siwan’s headband and Min-woo’s hats, which were quite noticeable. The use of all-black outfits and subsequently all-white outfits stood out against the soft, colorful background; this was managed in a way that allowed the members to pop, and not distract from the scenery. On closer inspection, it’s apparent that the colors merely tie the guys and the theme together; another layer of detail can be found in their fashion pickings. 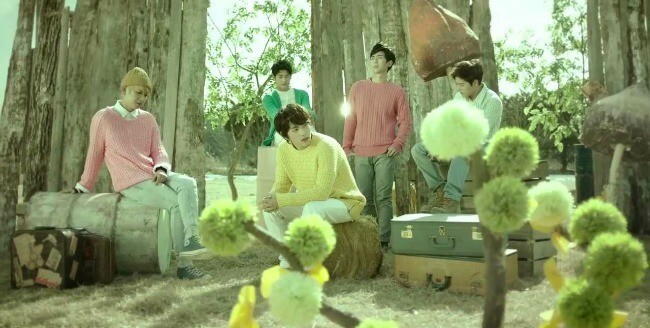 To further elaborate on clothing choice, the video’s best fashion moments are probably in the scenes where the boys are seen wearing a rainbow series of sweaters (with the exception of Dong-jun, who was wearing a button-up). 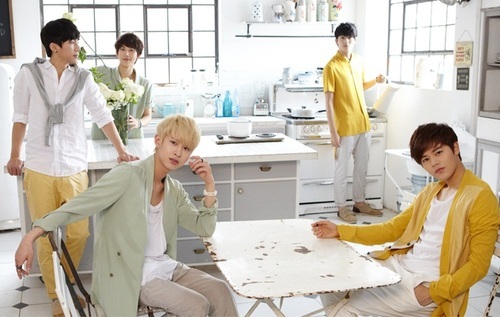 Overall, the color palette has made the members easily distinguishable in a soft yet fantasy-like atmosphere. However, I do have a final note here on clothing: coordi oppas and noonas, can we try to avoid having our idols freeze to death for the sake of these MVs? It’s obvious that they’re shooting somewhere pretty cold to have ice and snow — I’m looking at you lying in the snow, Min-woo. I can hardly imagine any more layers fitting under those light spring (or fall) clothing. Although this music video came without a complicated plot, or tears and drama, there’s been something about this that’s made it engaging to watch. Somewhere in the combination of bright colors, sweet song, fantasy props, and the members’ dispositions, this MV became quite aesthetically intriguing. The soft light, with an almost sepia tone of the day shots have been easy on the eyes, and the night shots have just the right amount of light to keep looking natural. In the end, despite the shortcomings of this entire production (song and MV), and the not-so-obvious lack of innovation, it’s a solid video that pleases the senses — I give it a score of 3.5/5. What about you, Seoulmates? 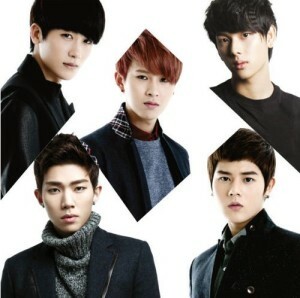 Is ZE:A5 better off in K-pop than in J-pop? Sound off below!